Note: Crazy Browser V2.x is no longer portable as it writes settings to the registry. Linking to the last available portable version (thanks AlephX). I agree, the older version, when I first installed it was excellent, pages loaded much faster than IE and it blocked pop-ups and other nasties as well. Recommend this browser! cheers. Tried other browsers ... its Crazy Browser for me ... I like the older version 2.01 still over the newer ones. 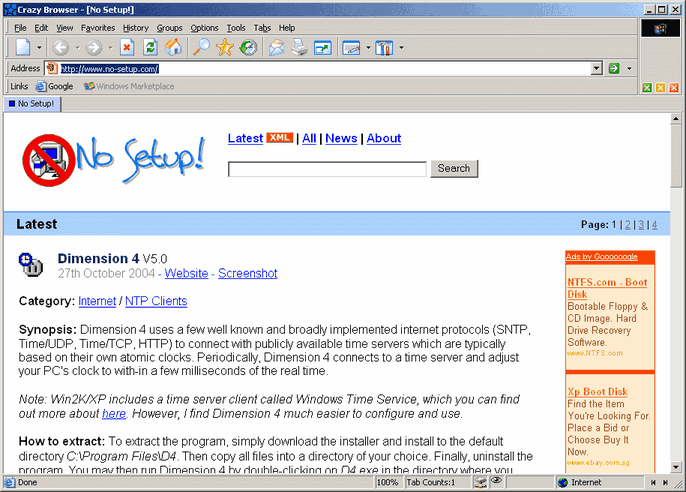 crazy browser 3.0.0 Beta2 runs on my windows XP wihtout installation. Just install it, make a copy of folder and uninstall it. run browser in copied folder. Maxthon plugins won't work so no use for me.